Sydney Evans | Singular Private Wealth, P.C. Born and raised in Charleston, South Carolina, Sydney Evans is happy to have found her (work) home within Singular Private Wealth. Part tech-whiz, part logistical mastermind, this fast-talking Millennial has her finger on the pulse of all the moving parts of the firm. “I love the pace of this work, the many details, and the constant change,” she says. Looking for an intellectual challenge, Sydney had enrolled in an MBA program when she met Heath Beam and was offered her current position. She chose the career opportunity over school. Even though this is her first exposure to the financial services industry, Sydney is a quick learner who has immersed herself in her new environment. She is eagerly absorbing everything from insurance to investments and the various technology platforms the firm uses. “My role is to execute,” she says. “I’m pragmatic, organized, and determined to keep the momentum going for our clients, and for our team.” One of the aspects Sydney appreciates most about her job is hearing client’s stories, and witnessing how the firm’s work impacts people’s lives and businesses. “My parents are Baby Boomers, so the work we do here is very real to me,” she relates. Outside of work, Sydney recharges by spending time with her faith community and teaching Sunday school. She also loves to explore the Low Country with her dog, Tallulah. 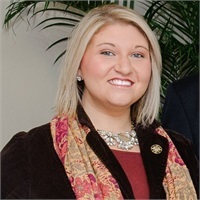 Sydney earned her undergraduate degree in Political Science and Economics from Winthrop University.